Big Western banks aren’t the only ones helping put Saudi Arabia’s economy and its state oil company's IPO back on track. The Kingdom might owe a certain gratitude as well to the Mexicans, US President Donald Trump's current targets. As crude prices returned to a bull market on Wednesday—rallying nearly 25 percent since Christmas Eve to provide the higher revenues needed to fix Riyadh’s budget deficit and keep confidence brimming before the listing of its Saudi Aramco company—conspicuously missing were tweets from Trump aimed at pushing the market back down. While a major oil rally six months back might have elicited an immediate negative response from the president, he’s bogged down this time by the US government shutdown brought on by his battle with Democrats and their refusal to fund the border wall he wants to built to purportedly shut out Mexican illegals. Trump initially said the Mexican government would pay for the wall. Bloomberg opinion columnist Julian Lee noted early this week that the list of things Trump criticizes in his tweets varies day to day, and the president may once again direct his ire at oil prices and the actions of his ally, Saudi Arabia, as the market rallies from the Kingdom’s bid to make good on its promise to slash supply. 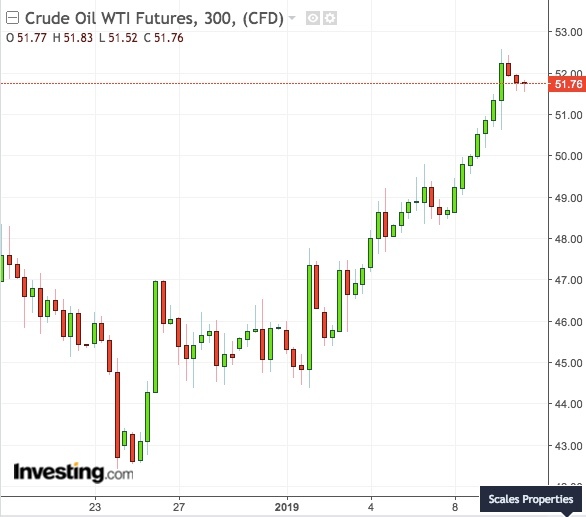 While there’s no certainty that a president can bring a market up or down at whim, Trump has a legacy for making news and affecting their outcome, and his tweets appeared a highly visible driver in oil’s recent 40 percent selloff from last year’s highs. But some think the president’s power to pressure oil prices might be greatly diminished, this time, by the Saudis’ will to cut beyond the 1.2 million barrels per day they had pledged through June. The Financial Times said on Wednesday that less than three months after professing horror at the Saudi killing of Washington Post columnist Jamal Khashoggi and scaling back their presence at a showcase economic forum in Riyadh, Western banks such as BNP Paribas, Citigroup, HSBC, and JP Morgan were managing a $7.5 billion bond deal for the Kingdom alongside NCB Capital—the country’s largest asset manager. Also missing was the deep concern expressed by the Western world previously over the Saudi war in Yemen, it said. Outrage over the Khashoggi murder and Riyadh’s role in the Yemen war were two factors that looked likely to bring US sanctions and other punitive action against the Kingdom last year, raising the specter of a Saudi Arabia beholden to Trump and fearful of running afoul of his tweets. But Saudi Arabia's 2019 budget unveiled on Wednesday looked a lot more assertive. The government pledged to boost expenditure by 7 per cent as it sought to kick-start a private sector bruised by years of lower state spending, after an earlier oil crash in 2014 and the impact of structural reforms, including higher domestic energy prices and fees on expat workers. Saudi Aramco was, meanwhile, expected to raise up to $40 billion in debt, perhaps in two tranches, to help fund an expected $70 billion transaction to acquire petrochemicals firm Sabic, before its listing in 2021. The Aramco IPO was initially put on hold last year. Saudi Energy Minister Khalid al-Falih on Wednesday said the country’s proven oil and gas reserves stood at around 268.5 billion barrels of oil and 325.1 trillion standard cubic feet of gas as of the end of 2017, answering a key question for potential investors in Aramco’s planned share sale. For oil traders particularly, he said the Kingdom was pumping approximately 800,000 barrels less a day from November’s record high of 10.2 million bpd. The amount it would ship overseas in February would be another 100,000 bpd less than January's 7.2 million bpd, al-Falih said. If it was last year, Trump might have sent out a negative tweet on hearing that.